Contents and Media: Full sized decal sheet and full-colour, double-letter size instructions with reference photos. Advantages: Superbly researched with excellent attention to detail; good variety of subjects; inspiring artwork; decals in perfect register; minimal carrier film and a comprehensive set of stencil data. Conclusion: This is an excellent new release from EagleCals. 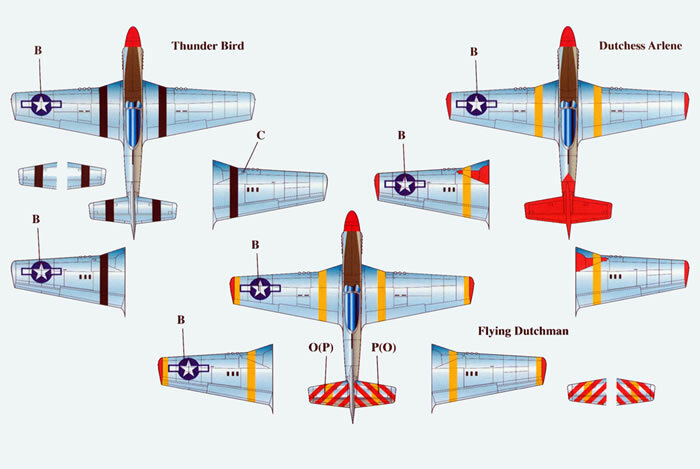 It provides you with top quality decals and supporting material to model three different bright and colourful P-51Ds. 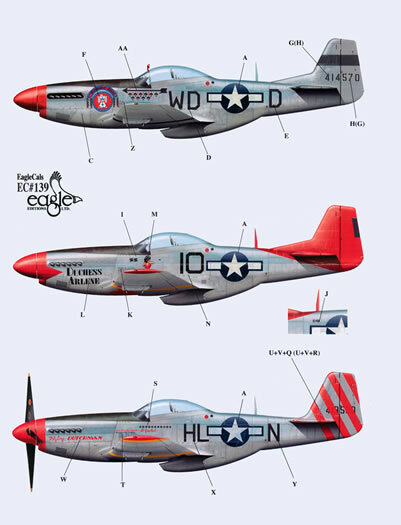 The release of the new 1/32 scale Tamiya P-51D has been a blessing for fans of the Mustang as it has prompted a veritable flood of new decal releases. This is beneficial for two reasons. Firstly, decals that have been around since the late 60’s and early 70’s are being re-leased with the benefit of more meticulous research and far better printing technology, and secondly, Mustangs that have never been seen in decal format are popping up. 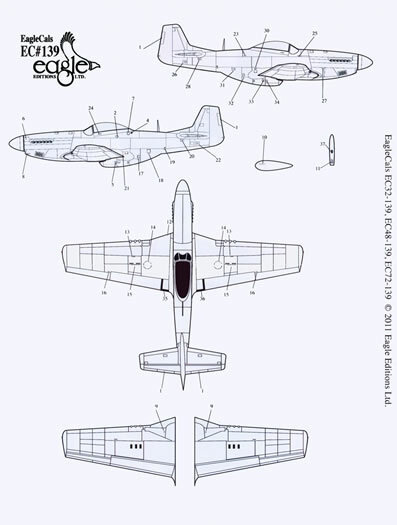 Eagle Editions Ltd are one of the decal manufactures who are embracing this new trend and have recently released three new Mustang sheets in their EagleCal range, EagleCals EC#139, EC#140, EC#141, and EC#141, with a fourth one, EC#142 to follow shortly. Each sheet carries markings for three machines. 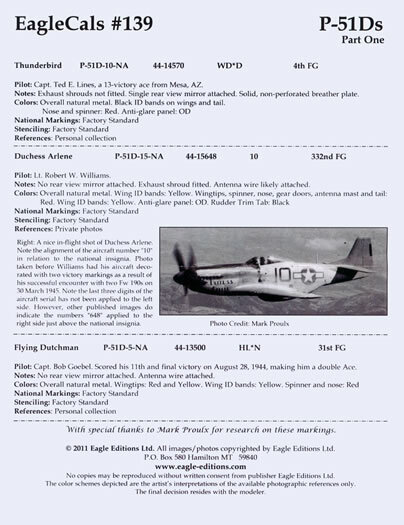 Combine these sheets with the previous EagleCals Mustang releases and you soon realise the Eagle Editions are into Mustangs! This set provides you with markings for an UK based 8th Air Force machine, as well as a 12th and a 15th Air Force machine, both operating from Italy in WWII. P-51D-10-NA serial number 44-14570 “Thunder Bird” flown by Captain Ted E. Lines of the 4th Fighter Group, 335th Fighter Squadron, 8th Air Force. The machine is in the standard late-war factory finish of overall natural metal finish (my bet is that the wings were painted silver) with an olive drab anti-glare panel. It wears the black European Theatre recognition bands chord wise around the wings, horizontal stabilisers and vertical stabiliser/rudder and the red spinner and forward fuselage 4th fighter group markings. The one-to-one scale machine wore tiny serial 4570 stencilled onto its lower engine cowling and the outer faces of its undercarriage covers and these are provided as decals. P-51D-15-NA serial number 44-15648 “DUCHESS ARLENE” flown by Lieutenant Robert W. Williams of the 332nd Fighter Group’s 100th Fighter Squadron – the Red-tailed Angels", 15th Air Force. The machine is in overall natural metal finish with an olive drab anti-glare panel with yellow theatre bands around its wings. A famed “Tuskegee Airman” machine it wears Group identifying markings comprising a red spinner and forward fuselage band (with a red triangle) and its entire empennage in red. P-51D-5-NA serial number 44-13500 “Flying DUTCHMAN” flown by Captain Bob Goebel of the 308th Fighter Squadron, 31st Fighter Group, Twelfth Air Force. The machine is in overall natural metal finish with an olives drab anti-glare panel. It too wears the yellow theatre recognition bands around its wings and horizontal stabilisers as well as some very bright group markings comprising diagonal red bands on its vertical stabiliser/rudder and its horizontal stabilisers. 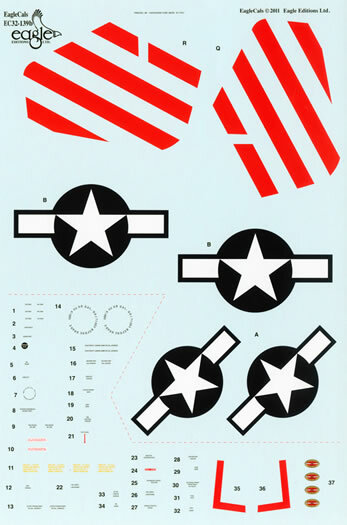 These latter markings are provided as decals and EagleCals have cleverly left the carrier film off the forward and rear parts of the bands so that they wrap around the surfaces that they are applied to. The sheet provides decals for the individual markings worn by the depicted machines, but you are on your own for the black and yellow theatre bands. A full sets of national insignia as well as a single comprehensive set of stencil data is provided with each option having a separate and correct data block. The placement guides for each sheet are A-3 in size and folded in four so that when you open it up you have full A-4 sized illustrations. 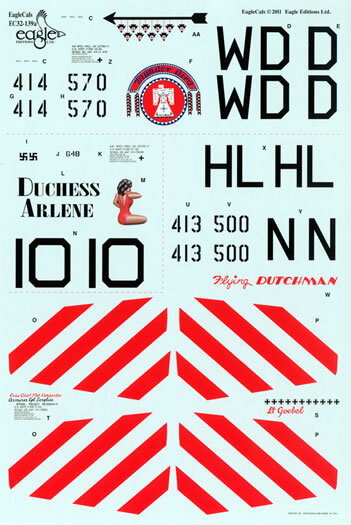 A left hand side full colour profile is provided for each option with the markings keyed by letter to those on the decal sheet. Smaller plan views are provided for upper and lower surfaces. The stencil data placement guide is a line drawing and it too is full A-4 sized. Notes for each option are also provided and these include a brief history of each machine’s pilot. The placement guide appears to have been printed using a good quality laser printer rather than the normal printing press. The decals themselves are produced by Cartograf, and very well produced they are! Everything on my sample sheet is in perfect register and there is an absolute minimum of carrier film surrounding each subject which is excellent as the film tends to show up when applied onto a natural metal finish subject. The decals themselves look very shiny and somewhat thick. I feared that they would be resistant to settling solution but a link provided off the EagleCals website to a review of their new Mustang sheets on the Osprey Publishing Modelling News website shows that they will work and work quite well. Are they accurate? EagleCals are well known for their meticulous research and the research for these four new sheets was done by Mark Proulx. There is however a disclaimer printed on the placement guide – “The colour schemes depicted are the artist’s interpretations of the available photographic references only. The final decision resides with the modeller.” From what I can find of the three subjects in my library and on the internet though, Mark and EagleCals have done an excellent job on these. The decal sheet and placement guide come packed in a clear plastic zip-loc bag. The sheets are also available in both 1/72 and 1/48 scale. This is an excellent new release from EagleCals. 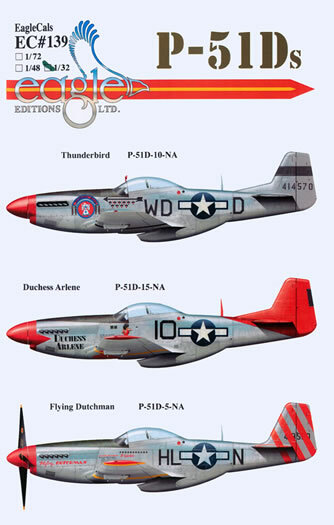 It provides you with top quality decals and supporting material to model three different bright and colourful P-51Ds.